Zend Studio is a leading PHP editor that allows developers to build high-quality PHP web and mobile applications. It is a PHP integrated development environment that increases the productivity of web and mobile app developers by permitting them to code faster, debug much easier, and maximize the gains from PHP 7. PHP 7 is the latest version of PHP as a server-side scripting language and general-purpose programming language. Zen Studio features an intelligent code editor that analyzes codes and provides features that help developers code conveniently. It is also equipped with advanced debugging capabilities that enable users to take advantage of market-leading debug tools. The PHP IDE lets developers access extensive plugins through the aid of its integration with Eclipse Marketplace Client. Last but not least, it permits the deployment of PHP applications on any server. The PHP IDE has a migration tool which allows developers to move their codes to PHP 7 in the fastest way. As they transition to PHP 7, this tool scans their projects for any compatibility issues and points out the exact lines of codes where such issues emanate from. It gives suggestions in order for developers to fix the compatibility issues quickly. With its support for PHP 7, Zend Studio enables developers to access the newest scripting concepts in PHP 7 that they can apply for their projects. When it comes to debugging and PHP profiling, Zend Studio integrates with debugging tools such as Xdebug, Zend Debugger, and Z-Ray, providing users with advanced debugging capabilities. As an example, they will be able to launch a debugging or profiling session directly from Z-Ray so they can discover hidden bugs or performance issues. Then, they can troubleshoot these issues within Zen Studio and fix their codes. Zend Studio streamlines code testing through the aid of workflows that help developers execute unit testing faster and write more reliable codes. Also, through its enhanced source control integration capabilities, users will be able to work with SVN, CVS, Git, and GitHub, allowing them to import their repositories easily. The PHP IDE offers a comprehensive library of plugins and add-ons. This is because it permits access to the Eclipse Marketplace Client, a platform where developers can find a lot of third-party plugins for creating rich web interfaces. Building mobile applications using Zen Studio is fast and easy. In fact, it has a mobile app which developers can use as a sample, letting them study, edit, or copy its source code so they can learn to create their own mobile apps or enhance their existing applications. They will be able to create mobile apps that they can deploy on different platforms. Zend Studio makes it possible to create framework-based applications that have the correct structures, files, and directories. As developers build such applications, the IDE permits them to create modules automatically, view helpers and controllers, as well as enhance content for services and variables. 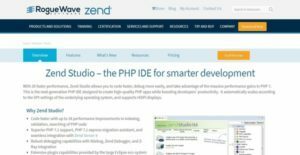 To wrap it up, Zend Studio makes it easy for developers to deploy their PHP applications on any server, whether they want to deploy them on-premise or in the cloud. They can also use the Zend Server for the deployment of the applications. If you are interested in Zend Studio it might also be sensible to check out other subcategories of Best IDE Software gathered in our database of SaaS software reviews. It is crucial to note that virtually no software in the IDE Software category is a perfect solution that can meet all the needs of all company types, sizes and industries. It may be a good idea to read a few Zend Studio reviews first as certain services may dominate only in a really small group of applications or be created with a very specific type of industry in mind. Others can work with an idea of being simple and intuitive and as a result lack complicated features needed by more experienced users. You can also come across software that support a broad group of users and offer a complex feature base, however this usually comes at a more expensive cost of such a service. Ensure you're aware of your needs so that you choose a service that offers specifically the features you look for. How Much Does Zend Studio Cost? Alongside its free plans which are dedicated to classroom and open-source projects, Zend Studio offers a perpetual licensing options for commerical and personal use. We realize that when you make a decision to buy IDE Software it’s important not only to see how experts evaluate it in their reviews, but also to find out if the real people and companies that buy it are actually satisfied with the product. That’s why we’ve created our behavior-based Customer Satisfaction Algorithm™ that gathers customer reviews, comments and Zend Studio reviews across a wide range of social media sites. The data is then presented in an easy to digest form showing how many people had positive and negative experience with Zend Studio. With that information at hand you should be equipped to make an informed buying decision that you won’t regret. What are Zend Studio pricing details? What integrations are available for Zend Studio?